I admit, I’ve been complaining about my RV oven. I had reservations about it before I ever turned it on. And truth be told, I was just waiting for it to fail me when I moved into the camper. My RVing friend, Alicia, told me her oven stunk. She hated it so much so that she took out her overhead microwave and replaced it with a toaster oven. She does 90% of baking in there and rarely turns on her oven. 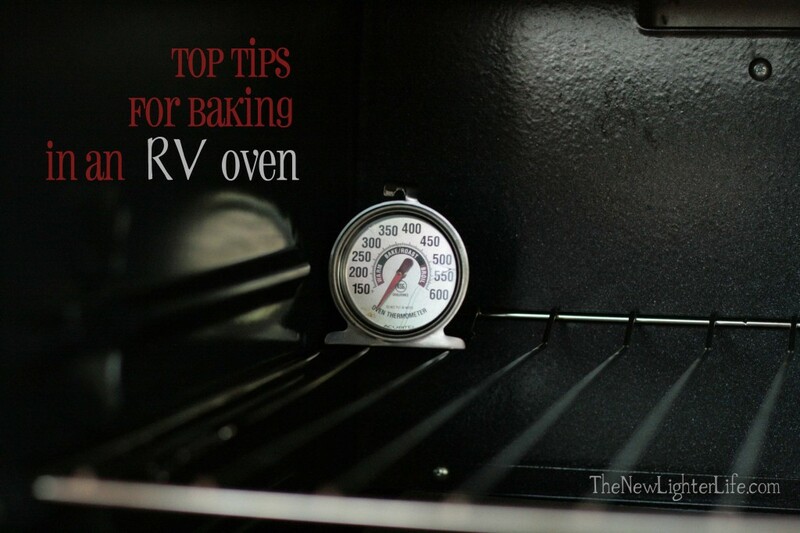 So what’s the big deal about an RV oven? Size. First of all….they are smaller. I can fit my 9 X13 in there, but barely. I had a Pampered Chef bar pan that I got rid of because it was just too big. I’m still sad over that bar pan…it was my bacon baker. Heat Source. It is propane. I’m not sure how much propane you burn through but I’m finding that I need to do less baking. We’ve gone through quite a bit of propane in the few weeks that we’ve been in the camper. There are other factors to contribute to our propane usage, this is just something that is on the forefront of my mind. Heat Element. The propane flame comes out along a rod from the back of the oven to the front. This rod is very hot…did I just state the obvious?? There is a thin metal plate right above, that I’m assuming is designed to transfer the heat. This is a major flaw in my very humble opinion. Preheating. There is no little buzzer or beeper that lets you know your oven is at the right temperature. Lighting the Oven. You actually have to light the oven with a lighter. Really RV oven people? How hard would it be to add a spark option for the oven? It’s already there for the burners on top. I scoured the internet in search of tips for baking in an RV oven. I found several sites that talked about replacing your microwave with a microwave/convection oven and baking in there instead of the oven. Some talked about dutch ovens. A few did offer tips….I compiled them and implemented the ones that were feasible. Below are the tips that actually worked. Preheat the oven. You just gotta do it. It feels like a big ole’ waste of propane but without it preheated, your baked goods have a greater potential to flop. I really wish there was a beeper to let you know your oven had reached the right temperature. But there isn’t and that’s just the way it is. Use an oven thermometer. The little temperature dial on the oven is most likely NOT accurate. Follow the oven thermometer and save yourself the headache of guessing the temperature. After baking several dishes in my oven, I know where my dial needs to be and I don’t even check the temperature. Rotate your pan. Rotate the baking dish halfway through baking to get as even of cooking as possible. Use stoneware or unglazed tiles. The massive heat from that heating element has to be transferred somehow to get a more even distribution. That thin metal shelf is inefficient at doing this! The best way is to place stoneware or unglazed tile directly on the metal shelf. When we first moved in the camper, I used my round pizza stone but the stone was getting discolored. Plus I want to use the stoneware sometime. So I bought 4 unglazed tiles from Menards for $0.44/each….that’s a deal if you ask me! Adjust your wire rack. By moving this rack up higher you don’t have the intense heat and the temperature is a little more even. 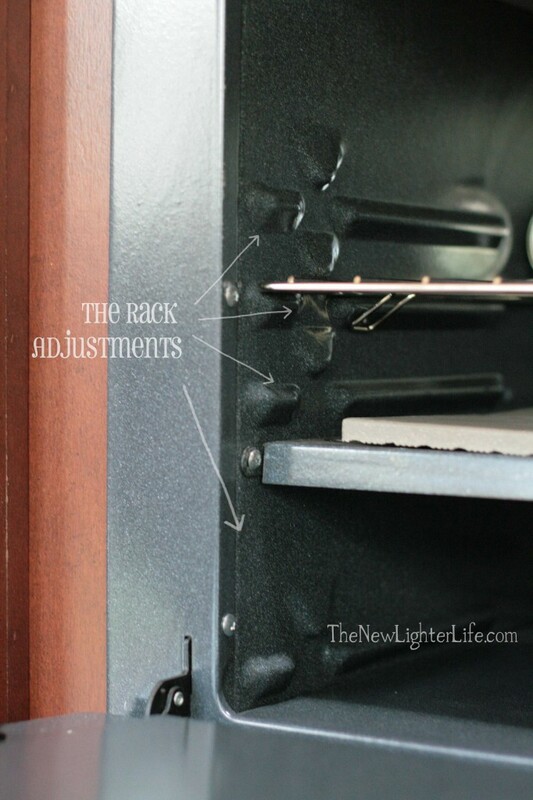 Our oven has more levels to adjust vs other camper ovens, so we have more flexibility. I also read that you can adjust the thermostat on your oven. Our particular oven does not have that option though. We’ve had a few mishaps…but after implementing the changes above it’s been VERY easy to bake in the oven. 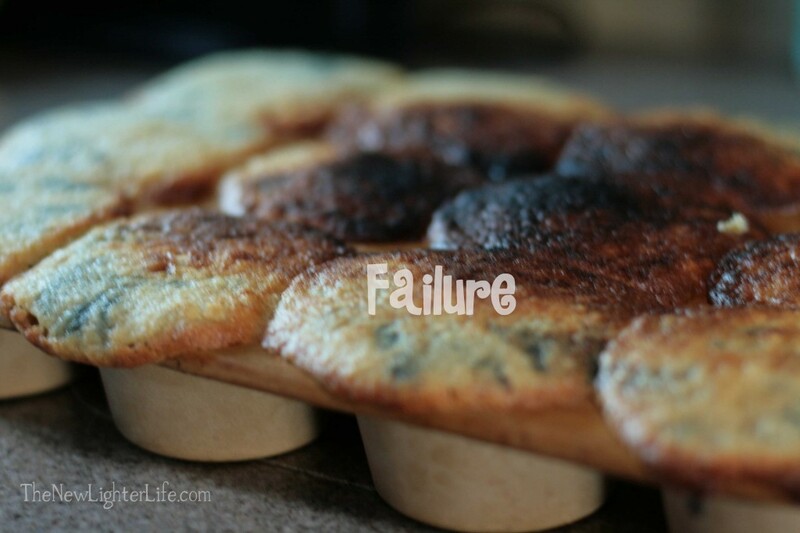 There were so many things that went wrong with the blueberry muffins above! 1st – I didn’t preheat the oven. 2nd – I didn’t have it set at the right temperature. 3rd – I tried to cook the flat un-risen tops by placing them on the bottom shelf. The result was so funny I figured I’d share. So I hope this helps anyone trying to figure out an RV oven. If you have any more tips, I’d love to hear them! This post may contain affiliate links. These affiliate links help support this site. For more information, please see my disclosure policy. Thank you for supporting The New Lighter Life. Great Nikki! I hope my tips help! I didn’t Jenn…but oh my goodness I want to! I miss my bar pan! Boy did I goof. My RV came equipped with only a convection/microwave oven. Did not do too well with the convection and thinking if I got the regular oven my problems would be resolved. WRONG I had no idea it would not be like my oven at home and the man who sold it to me and installed it neglected to provide me with any information. So, now here I am, now better off and trying to learn how to bake in my RV oven. Hate this!!!!! We are preparing to install a micro/convection oven. Why did you not like the convection oven? Good luck Ken! The RV oven really had me frustrated at first. If your wondering, pampered chef makes a medium sized bar pan that fits easily in our camper oven 🙂 stoneware has saved many of my biscuits! Thank you Dani! I LOVE my pampered chef! Stoneware makes such a difference in the camper ovens! I RECEIVED A 12X 12 UNGLAZED CERAMIC TILE FOR MY OVEN AND THE FIRST TIME I USED IT, THE TILE BROKE. I WOULD LIKE TO KNOW WHAT OUR MAGIC TRICKS ARE OUT THERE FOR OVENS IN RV’S. YOU WOULD THINK THESE MANUFACTUERS WOULD COME UP WITH A BETTER SYSTEM. MY OVEN HEATS 25 DEGREES HOTTER THAN IT IS SUPPOSED TO!! WOULD APPRECIATE ANY HELP OR COMMENTS, PLEASE..
I’m sorry Judy! I really don’t understand why your tile broke, but one thing I know, unless it shattered into little bits and pieces you can still use it in your oven to distribute heat. I would definitely keep using the thermometer and keep your oven set 25 degrees lower to compensate for the poor calibration. By chance is your RV still under warranty? I have use T-fal brand Air Bake cookie sheets with great success. Just find the right size for your over. They are available online at Amazon and at local stores. Thank you Ed! A great option for more even baking too! What size tiles did you buy? I’m attempting pizza homemade . Oven is preheated to whatever it is…no thermometer. No tiles either. Fingers crossed. Hope your pizza turned out yummy Norma! 🙂 I think the trickier foods to bake in there are cakes or cookies. lol, I thought your oven was to store your bread. Really thats what the RV dealership told us jokingly of course, he said not many people actually use it. That being said I’m nervous about using it, but willing to give it a try. Did you try it yet Susie? 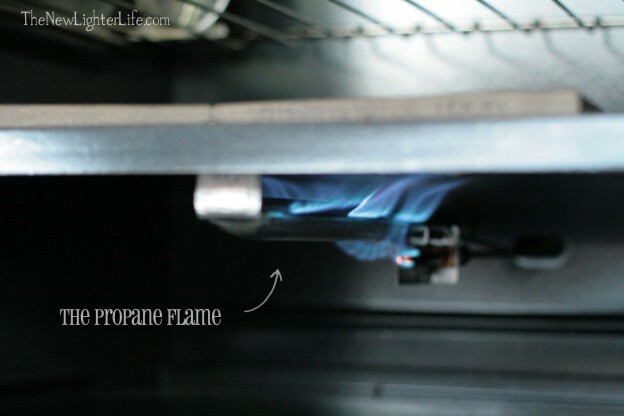 We heard something similar…but managed to use our oven quite a bit once we learned these tricks. Why install something that takes that much room and then not explain how to use it. Or worse joke that no one uses it. If that’s the case put it in as an option. I purchased 4×4 unglazed square tiles from Amazon – simple keyword search resulted in a box of 6 for a decent price. 4 in the oven with 2 spares just in case works well for me. I also discovered in my first cookie flop that the oven most definately was not gauged properly so a trip to WalMart resulted in my new temperature gauge. I already baked regularly with the Air bake sheets & have always loved those. The resullts in my RV oven have been positive since. I’m wondering if there is any difference with using the stoneware. I will have to check that option out. I have done this for years. I also had camping world put in a 21 inch oven and it makes a world of difference. I can bake anything without burning it. Have you baked cup cakes ?? I’m fixing to tonight sad would love any advice …. I was told that what temp says for regular stove to back off degrees in rv stove ??? I did bake cupcakes and I used my method above, instead of 350 degrees, I baked at 325 degrees though. I’m glad I searched before attempting to bake anything. We will be on vacation during Father’s Day, and I want to bake my husband his favorite cake. I’ll update. Keep your fingers crossed, lol. Never did it. I had a grand mal seizure and slept the next day, lol. I learned using the tiles on the metal shelf trick from some Canadian camping friends years ago. Really: Problem solved! It can be hard to find ‘unglazed’ tiles anymore in smaller markets. I ended up buying a 12″ travertine tile at Lowes. One small corner cracked but it works great. I’ve made cookies, rolls, muffins, biscuits, even a small beef roast. (in a square pan all tucked tightly in a couple of layers of heavy foil with dry onion soup…baked at 250º for a few hours.) Yeah, it can be a bother lighting the pilot each time, but if we are going to be in one spot for a period of days, I just leave the pilot on till we roll again. It only uses a tiny bit of lp. Thank you for sharing your experience with baking. My husband and I are going to start our RV living this coming August and I have been reading the comments on RV living. I will make sure I try your technique. Thank you very much for your tips, I’m going to give them a try. My wife and I travel for my job about 10 months each year, and she has tried to use the oven several times. Each time was a lesson in humility. I love baked goods and the ability to have casseroles without having to go to the restaurant. Our oven has served as a storage bin for her pots and pans. But I will get some tiles and a thermometer and see if they make a difference. I suspect that ovens are like every other piece of equipment for rvs, they are light weight and rugged because they are in an rv they have to endure bouncing down the road and not create a fire hazard, as a result, they wouldn’t stay in calibration even if you could calibrate them. However, it seems to me that the rv manufacturer’s could work out the bugs. There is a lot of room for improvement. Why don’t they just place electric ovens in the units? I am not an rv’r (yet) but hope to be soon. I’m just a newbee to all of this. I am a cook and use my home oven a lot. I also have a huge toaster/convection/rotisserie that I won’t sell and just keep. Hi Ann…I’m guessing they don’t do that because it would make boon docking and baking an impossibility. I’m hopefully with all the new innovations, they’ll figure something out. 🙂 Happy RVing! I’ve been RV’ing 4 6 months now. The oven is a real challenge. I’m so excited to find these tips. I’ll be finding ceramic tile today. Because I don’t trust the oven, my Dutch oven & crockpot has become very easy to cook in & thanks to Pinterest I’m never without recipes. I’m making a friend a Birthday cake this wknd & now I’m going to give it a try in my oven. Thanks Julie for the Awesome tips. Am on our winter holiday to Texas. Bought our new rv, with convection micro plus regular propane oven. Found out years ago about using tiles in the oven. Had a stone plate I put in oven. It split down the middle because off the high heat from center flame. Still works great. It is in two pieces rather than one. Oven thermometer regulated temp. Great advice. Convection again is a learning experience. Often campgrounds have low voltage drops that can make baking with electricity difficult. Barring that I found I had to read and follow directions very carefully. Make sure oven is at proper temp and experiment. I finally had great success with a pecan pie. It can be done. A simple peice of aluminum foil placed above the metal separator does the trick for us. The real problem is that the metal gets red hot and blasts your food/pan with intense infrared rays. The single sheet of foil blocks those rays as well as ceramic. The benefit of foil is that it doesn’t have the heat capacity of the tiles, which translates to not taking as long for your oven to warm up, and thus saving propane. I admit we don’t do a large amount of baking, cupcakes on birthdays is about it. But we cook pizzas and various dinner dishes in there on a regular basis and we still don’t preheat the oven ever. I can imagine it matters more for baking vs cooking, but worth the experimenting if one is curious. For the record we’ve used the foil method for a couple years now in two different RVs. You commented on wishing you had a buzzer to tell you when you’ve reached temperature. I use a bbq digital thermometer with an approximately 24 inch flexible wire to the read out. 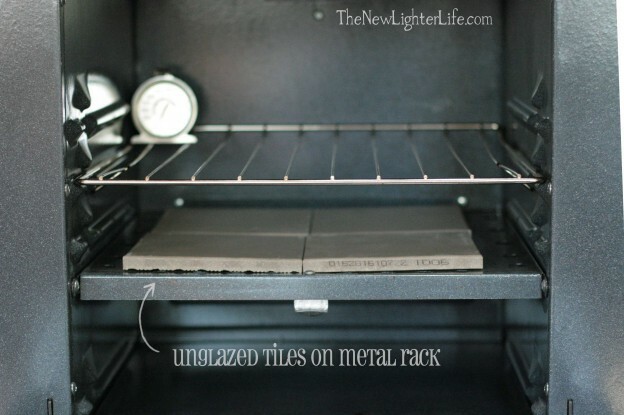 Set your desired temp and put it in the oven and the read out with a magnet sticks to the outside of the oven. It beeps at set temp. I use my RV oven and have not had any problems. In the summertime I use a box oven (my daughter was a girl guide) outside. This is absolutely AWESOME. There is no heat inside to deal with and as long as you have a bag of briquettes you can bake endlessly. We took our 4 grandchildren camping last year (all under the age 9) and we made cookies, cake, corn bread and roasted a chicken. There are many web pages with instructions on how to make them. Look for cardboard box oven, scotch oven and/or box oven. I had the kids help me to construct it. The dads were all very dubious about this whole process, but enjoyed all the goodies afterwards. Try it in the backyard first. Very smart, Barb!! Yes, keep the heat out of the camper! I think we’ll try it out this summer just for fun in South Texas. All these good ideas! Thanks! Only one I can think of is check the altitude when camping and adjust time/temp. Yes, you’re exactly right Terry. So important for baking and the fluctuations with moving locations, many may not remember. When I use my oven, don’t use the dark non stick ware. If you spend a little more for the silver heavy duty stuff, it works better. Great tip Thelma. Thank you!! I have a metal pizza pan that has holes in it. I put that directly on top the metal shelf. It helps to defer some of the heat while letting some through the holes. Works great. Glad you found a solution JoAnne! RVers have to get creative. All of your suggestions are spot on. I just wish that it was easier to light……having to get down on my old “bionic” knees is not an easy feat! I prefer using my oven to the microwave/convection, especially when in make meringues or things that need lower temperatures and longer cooking times. How thick are the tiles used in the oven? And are these the Patio tiles? They are somewhere between 1/4″ to 3/8″ thick, (your standard tile) As long as they are unglazed, they will work. Good luck! A BIG OMG!!! This is soooo of wrong… spend thousands of dollars on bells and whistles, tvs and WiFi and outdoor tvs and refrig….but the ovens are a joke??? Going to have to get a discount when purchasing one… like….”let me pull the oven out and you keep it Mr. Dealer.” So so wrong. Wow. Yes…it is very unfortunate. My hope is that the outcry from RVers will prompt them to make better ovens. I bought a small foil roasting pan and turned it upside down over the heat bar. It disperses the heat great! Everything bakes as it should! We just started FT RV living and I baked my first cake tonight. Should have searched for tips sooner! Thanks for the info! Thank you! Building Moms a tiny home, this is exactly the stuff I needed to know, you just saved us 20″ floorspace (a big deal in a 24′ trailer!) if I don’t need to go with a freestanding! Glad it helped you Sondra! Best wishes!